Timur Lukas’s work begins as soon as his mind is clear. Only then are his powerful color compositions free to unfold over the picture’s surface. 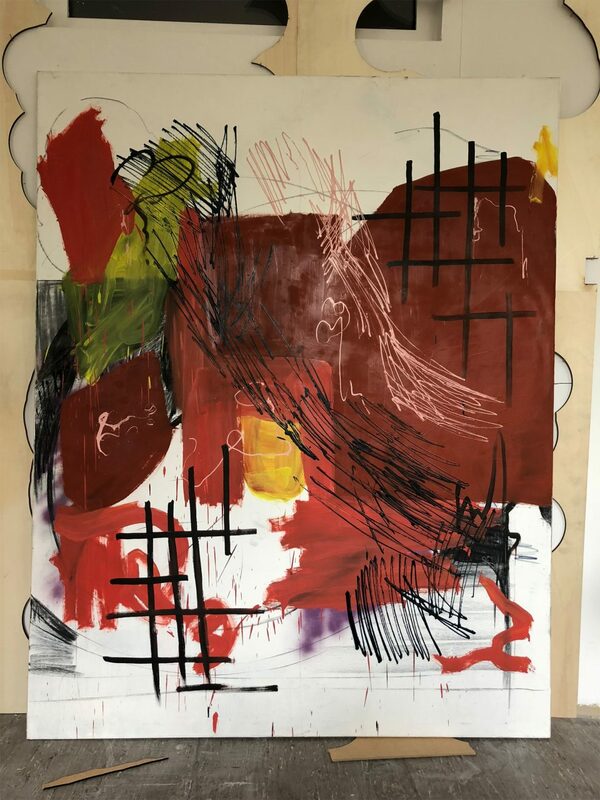 From the shoulder and elbow, the artist moves his brush across the canvas without inhibition, and individual forms seem to glide easily into place. The artist works both spontaneously and thoughtfully. By combining variations made up of filigreed lines and coarse brush surfaces, a dynamic is released which is rounded off by his powerful use of color. 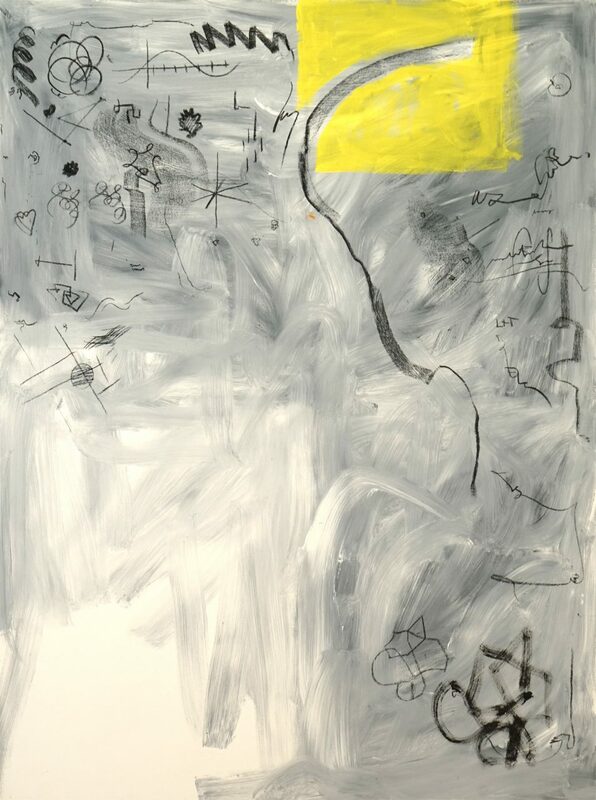 thought-out and seemingly spontaneous and uncontrolled brush movements fall into place. 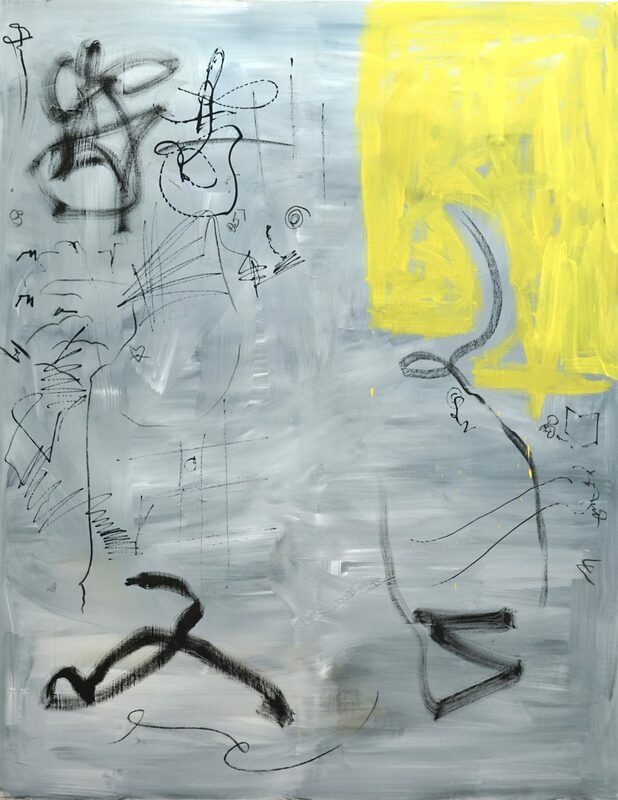 For example, the work Perfectly Imperfect (2018, oil on canvas, 190 x 150 cm) begins with an uneven, bright yellow rectangle at the top of the picture. This is surrounded by repetitive black accents in charcoal, oil and pastel. These accents are applied in different thicknesses, which makes them look like impressions of each other, but they have been placed next to each other freehand. They are reminiscent of calligraphic signs that place fine quotes next to the fleeting brush movements. In other works, we recognize concrete words. At first glance, these seem like spontaneous notes, lending these artworks an added linguistic level. Lukas combines powerful colors in both his smaller and his large-format works. These colors do not mix on the primed surface, instead they retain their own spaces. Each color can stand for itself without having to refer to anything else. Sometimes the paint is applied so thinly that it looks like chalk, allowing the underlying background to shine through. In other places, the strokes are so full that individual bristles appear in them. Even in the smallest of forms, this creates an interplay of muted and flickering color. In their combinati- on, they achieve an effect that is at once relaxed and thoughtful, clear and blurred, loud and yet quiet. Timur Lukas explores the relationships between color, form and structure in his art. His works are only completed when it no longer feels right to continue working on them. 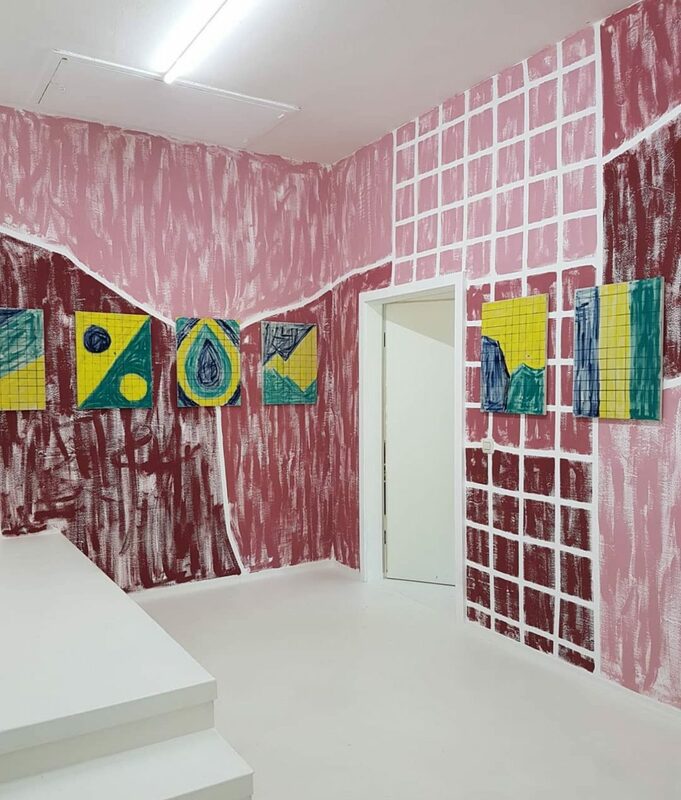 In addition to the canvases, works which the artist composed using several individual sheets of paper were also created for the akkord exhibition. 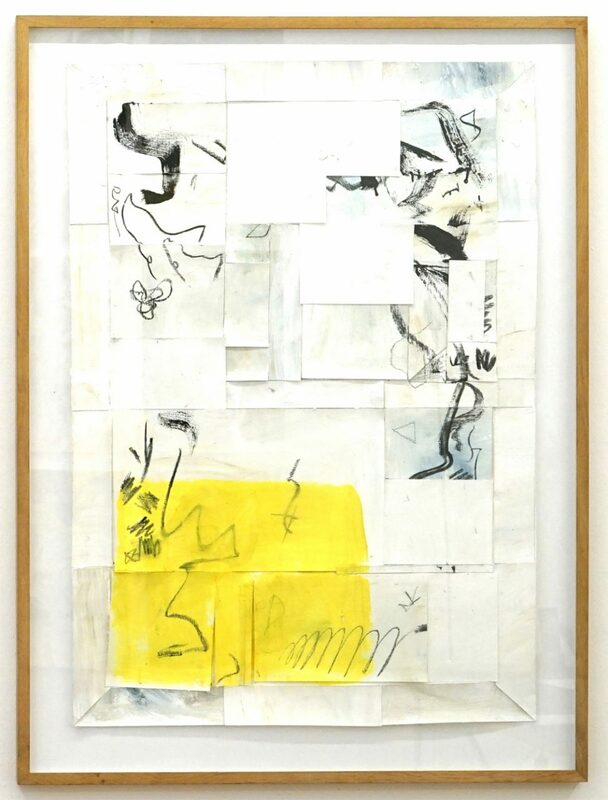 By so doing, he uses the motif of the picture grid, a motif found in many of his works and one which, above all, serves as a means of orientation in larger works. 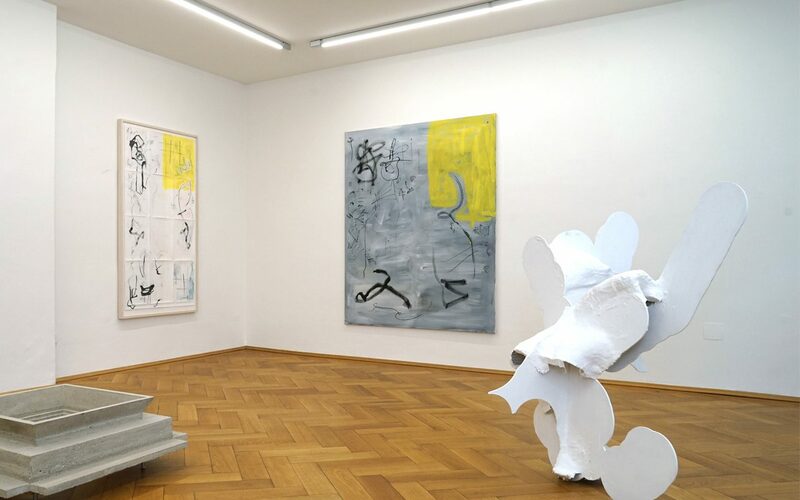 In comparison, the artworks shown in the Gallery Rettberg are characterized by a more spontaneous arrangement of forms on the support medium. The compositions now seem to float more freely on their foundations, as if we could observe them gradually taking shape.